Single-lens reflex cameras have become a valuable tool in the surgical theater. 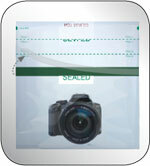 Photographing procedures enables surgeons to consult with peers on interesting or difficult cases in real time. Photos are a great asset in creating a visual baseline for healing and recovery in post-operative care. Documenting surgical procedures is an effective tool for training and educating residents. The sterile eShield™ will enclose cameras so they can be conveniently positioned for the surgeon’s direct control from the surgical table. 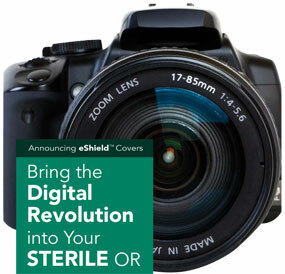 The eShield™ is the only FDA approved single-use cover for use in the sterile field. 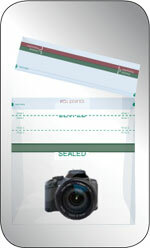 This real solution for a real problem saves time and money by eliminating the need to re-glove. For SLR cameras, the eShieldTM comes with adhesive rings to adhere to the bag wall to the camera lens eliminating extraneous light and improving photo quality. 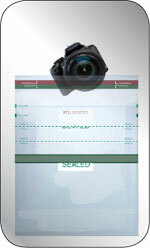 The eShield cover creates a barrier from contaminants on devices. ASTM 1671F certified against viral penetration. 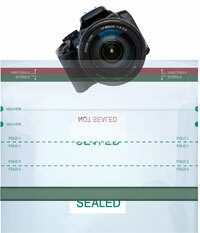 Ultra clear polyethylene film for sharp photography. Nurses responsible for managing the OR can rest assured that the eShield will help reduce disruptions and protect the sterile field from contaminants on devices. 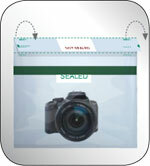 Canon, Nikon, Olympus, Sony, Panasonic and Kodak and most other SLR cameras.